ABIES-Electronicus (aka XMAS Tree), the giant abstract Christmas tree in the Plaisirs d’Hiver festival in Brussels has been met with surprising controversy. Designed by 1024 Architecture, the color-changing LED and fabric sculpture welcomes citizens with glowing lights in the Market Square. The architectural sculpture morphs from one color to the next while set to music, and invites visitors to climb to its peak to get a bird’s eye view of the city. Rather than hacking down a historic tree, 1024’s installation gives the suggestion of a tree, but with an architectural and pixel-like twist. During the day the tree appears a bit like architectural construction, with poles and scaffolding jutting in every direction. But once night falls, the “tree” is illuminated, and it blinks, glitters and dazzles along to music. As the structure changes from green to red, visual projections also dance within each of the block-like branches, giving the square (and visitors gathering around) a warm glow. Guests can also climb this eco-friendly faux tree. The “trunk” is made from a staircase, which leads visitors to an observation deck 63 feet above the ground. From the top of the tree, visitors can take in panoramic view of the city, as well as the other pieces in the Plaisirs d’Hiver festival. 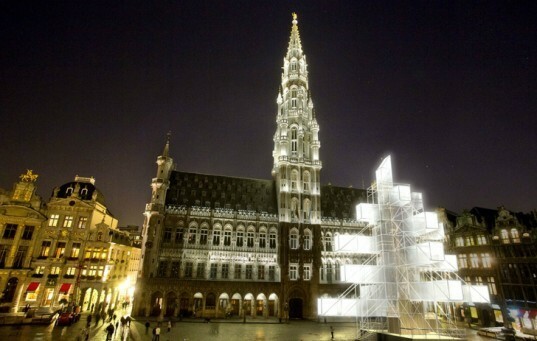 The architectural tree has caused controversy in Brussel’s Muslim community, who found the tree to be too Christian for a citywide light festival. Yet the Christians took an even different view, hating on the tree because it is too abstract and not tree-like enough. Either way, the color-changing LEDs and observation deck make for a creative and sustainable tree alternative! 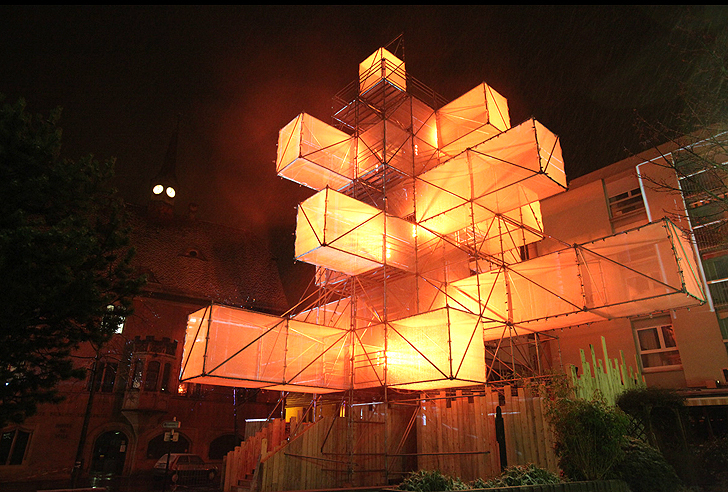 Rather than hacking down a historic tree, 1024’s installation gives the suggestion of a tree- but with an architectural and pixel-like twist. During the day the tree appears a bit like architectural construction, with poles and scaffolding jutting in every direction. But once night falls, the “tree” is illuminated, and blinks, glitters and dazzles along to music. Guests can also climb this eco-friendly faux-tree. The “trunk” is made from a staircase, that leads visitors to an observation deck 63 feet above the ground. From the point of the tree, visitors can take in panoramic view of the city, as well as the other pieces in the Plaisirs d’Hiver festival. The architectural tree has caused controversy in Brussel’s Muslim community, who found the tree to be too Christian for a city wide light festival. Yet the Christians had an even different view, hating on the tree because it was too abstract and not tree-like enough. Either way, the color changing LEDs and observation deck make for a creative and sustainable tree alternative!